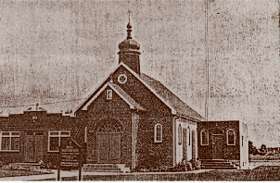 In 1953, Mr. And Mrs. Lev Mizun donated a parcel of land just south of Burnhamthorpe Road on the east side of Cawthra Road for the Ukrainian Catholic community to build a church. 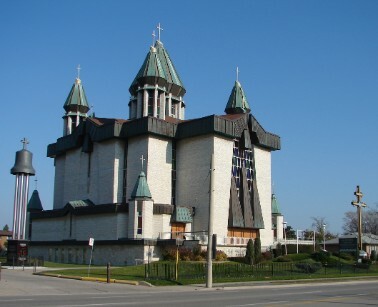 Religious services had been held in the Mizun’s home for some time, until they donated the land and the church of St. Mary’s Dormition was constructed on Cawthra Road, just south of the Cawthorpe Plaza. The first church administrator was Rev. Michael Horodysky. He was replaced by Rev. Matthew Berko in 1967.As the congregation grew, the church elders decided that a larger church should be built. The design for the new church by Architect R. Dumyn was elaborate. 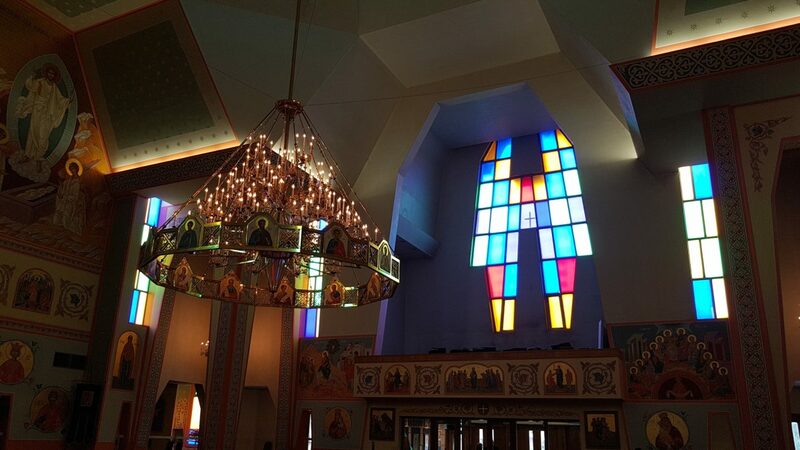 From its basement foundation of greenish white Ontario marble to its three storey flat roof topped by a large central dome and four smaller copper turret domes each holding a gold cross, this majestic structure is described as “a unique blend of traditional Byzantine and Ukrainian Church architecture with modern aesthetics, materials and techniques. The church’s monumental form with glittering domes and crosses dominates the skyline, making it a landmark in the City. Although the groundbreaking was in August 1968, the community center was built first and the first service was held there in March of 1970. Work on the upper church began in 1975 and was not completed until 1977. The congregation of St. Mary’s celebrated its opening with the first service being held on Sunday, December 25th. On Sunday, June 10, 2003, St. Mary’s Ukrainian Catholic Church in Mississauga, celebrated its 50th anniversary of the church’s founding with a Pontifical Liturgy and a gala affair attended my many dignitaries. At the time, pastor of our church was our current Eparch of Toronto and Eastern Canada, Most Rev. Bishop Stephen Chmilar. Today, with Dean Rt. Reverend Roman Pankiw as Pastor, the parish numbers over 1300 families.